Now that our Garage Sale is over, I can get back to blogging. In the middle of the garage sale madness, our garlic put on their scapes. A scape is a garlic flower bud. If left on the plant the scape will blossom into a white allium type flower just like the Chive Blossoms. The scape is the curlicue part of the garlic plant pictured above. Garlic cloves are a type of bulb, just like a tulip, well technically just like an onion but people are more familiar with tulips. 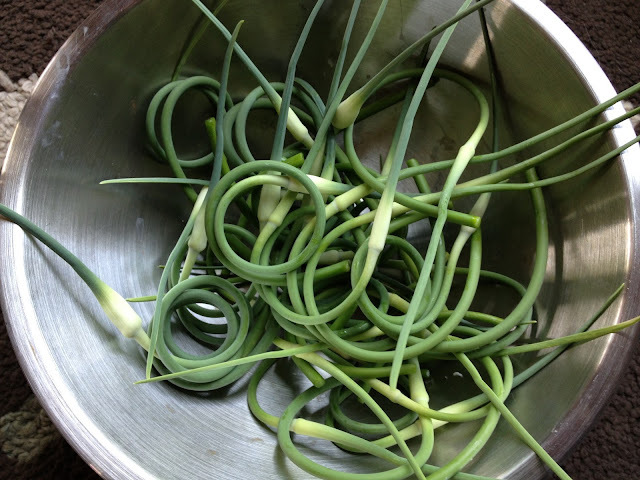 Scapes grow on hard necked varieties of garlic. Hard neck garlic is generally grown in the north while most soft necked garlics are grown in warmer climates. Garlic growers usually remove the garlic flower bud, the scape, before it opens. This forces plant growth back into bulb production rather than into flower production. And since we grow garlic for the blub, not the flower, I snap the scapes off my garlic too by just snapping the scape off the plant, usually just below the curlicue. Usually we grow enough garlic to last until the next year's garlic crop. However, a significant amount of our garlic did not survive our insane spring weather this year. The weather kept vacillating between fifty degrees and twenty-five degrees. Just as soon as the garlic, and most of the other bulbs in the garden including the tulips and hyacinths, started to grow there would be a hard freeze followed by growing weather and another hard freeze. The picture above is the entire harvest of scapes. Usually we have at least twenty times that amount. If you don't grow garlic (which you should do because it is so easy) you can buy scapes at the farmer's market. But whether we have a little or a lot of scapes, we need to do something with them. My favorite thing to do is to turn them into pesto. If I had more scapes this year I would also have pickled some and used them fresh in cooking. For a garlic scape pesto there are a variety of recipes. Some using basil and some not. The most basic garlic scape pesto recipe uses scapes in place of garlic cloves, from 1/2 cup to 1 cup of chopped scapes in place of the garlic cloves. Scapes taste like garlic; surprise, surprise I know. This recipe has a lot of bite to it. I think the vinegar balances nicely with the spiciness. To start, put whole (washed and dried) scapes into a food processer to chop coarsely. Then add the basil on top and pulse several times. You may need to add the basil in small amounts. This is especially true with my rather small food processer. After a few additions of the basil, the green mixture no longer pulses well. This is when I start adding the olive oil. Drizzle some of the olive oil in along with each addition of basil and pulse a few times. Once all the olive oil and basil is added, run the food processer until the mixture has the consistency of a thin paste. You don't want to be able to see chunks of scape or basil. Next I add in all the grated cheese, balsamic vinegar, and salt. Note, depending upon your taste you may want to add the vinegar in a little at a time to suit your own taste or skip it all together for a more traditional pesto. I often add more than the 1/4 cup. Another note, I grate my own cheese with a micro planer for pesto. It is so much better tasting than the pre-grated stuff in the green can if you know what I mean. And since pesto is not cooked, the flavor of each ingredient is very important. Pulse the pesto until thoroughly mix. Then taste test. If the pesto is too spicy or sour for your liking, add more cheese. Remember the Pecorino Romano is very salty. Most often I put pesto on cooked pasta. But it also is great as a spread for sandwiches (try pesto with salami, gorgonzola, lettuce, and capers in a whole wheat wrap... trust me, try it). It also is great on chicken! I saw these at the farmer's market and wasn't sure what one would do with them. Thanks for the info. You are welcome Kara. The first time I saw them in a farmer's market I just sort of stood there, a little uncertain if I even wanted to ask what they were. But I am glad I did. Scapes are really yummy... if you like garlic that is. YUM!!! We love pesto over here so this is perfect. Thanks for sharing at Our Real Food linky. Have a wonderful week! I really enjoyed reading your blog, it was very informative on garlic. And your pesto recipe sounds great. So glad you stopped by Kathy (and by the way your blog is so beautiful)! This recipe is really yummy. I hope you get a chance to try it. عملائنا الكرام نحن نعرف نطاق خوفك وحرصك المتنامي في اختيار أفضل مؤسسات نقل العفش وتكون هي مؤكدة وموثوقة في التداول معها، فلا تقلق نحن وفرنا جميع الخدمات المتوفرة في شركتنا مؤسسة نقل أثاث بابها هي تقدم جميع الخدمات بلا رهاب أو إرتباك.